I know almost nothing about this song, besides the fact that it is a lyrical palindrome (Not a musical palindrome, as I initially typed. I’m sure that some composer must have explored palindromic music, and if you are better informed than I in this department, I encourage you to enlighten me). It comes from a compilation of two-minute songs that a previous band of mine participated in: ‘I Am Shorter Than You Are Taller Than Am I,’ which appears to be available via the Kelp Records page. The liner notes reveal only that Big Fish Eat Little Fish was a band from Ottawa, Canada. As always, I THIRST for further examples of palindromic lyrics / music. How Can You Live With Such Self-Defacement? The lyrics are palindromic in a broader way, in the sense that the entire song is the palindrome, as opposed to being made up of a series of palindromes. So you see, if one were to treat each WORD in ‘Word Awk’ as a LETTER, THEN it would be…(Head Explodes). Another of the links posted in the comments references a book I’m trying to read right now: Godel, Escher, Bach: An Eternal Golden Braid. This is a good book to read if you like music, math, and art; and don’t mind your head exploding occaisionally. One of my current places of employment, the Ann Arbor District Library, had a pretty great event this past Saturday. As part of their Axis Teen program, they’re sponsoring a five-month long Mario Kart Double Dash Tournament. Tournament play takes place once a month, and judging from the reaction Saturday’s event was met with, each month’s proceedings will draw more kids into the library. Eight Gamecubes were networked together in a LAN, and the S-video outs of each station were taken to a Video Toaster rig, which in turn had its output fed to a projector. This displayed the view of the leader of the race in progress, intercut with live video of the players and bracket information – all on a large screen in the center of the room. 8 players (16 in team mode) were able to play simultaneously on dedicated screens. The Ann Arbor News wrote a story on the event, and I have some ridiculously shaky footage of the room in action from my camera. Burt Reynolds was in “Starting Over” with Kevin Bacon! The challenge is to get from Kevin Bacon (Who records music with his brother as ‘The Bacon Brothers’) to Jon Brion, in six steps or less, using only albums they’ve worked on. It looks like the Bacon Brothers have had some high profile guest appearances (ie Jon Bon Jovi), so it should be doable. Incidentally, in piecing this entry together, I googled for six degrees of Kevin Bacon a bit. Given the state of geekery on the web, I’m AMAZED that no one has attempted to write some sort of Kevin Bacon Game php script using the imdb php class. So I guess that’s a bonus challenge. Write that. UPDATE! I don’t know how I missed the Oracle of Bacon on first googling, but I did. So yes, someone has written such a script. I was grocery shopping a few days ago, and I happened upon a bin full of “Dinosaur Eggs.” Clearly, these were not actual dinosaur eggs, but some weird crossbreed fruit, renamed to attract the fervent interest of five year-old boys. As five year-old boys and I share many of the same interests (video games, dinosaurs, robots), it should go without saying that I bought some. 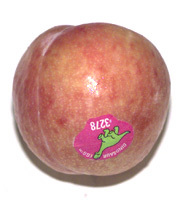 A bit of google, liberally applied to the nagging question of their origin reveals that they are in fact “Pluots” – plums crossed with apricots, and they are DELICIOUS. I’ve also found reference to them being called ‘Apriums’ and ‘Flavor Grenades.’ ‘Flavor Grenades’ would probably be equally effective in the ‘Incite five year-olds to nag mom for this fruit’ department. That night I dreamt that the world was being invaded by dinosaurs who turned people into crazy, bloodthirsty zombies by biting them. Good times. Another MP3 of this week: ME. Busy week. Job interviews, recording, programming. Here’s a recently finished MP3 of a song featuring me on drums. WATCH OUT FOR THE TRIPLETS. Recorded by the eloquent John Krohn at Deep Deep Pink studios.